Veritas is proud to announce the forthcoming publication of Walking on the Pastures of Wonder: John O’Donohue in Conversation with John Quinn, a poignant and inspirational collection of radio conversations and presentations from philosopher, poet and bestselling author John O’Donohue, who passed away in 2008 at the age of just 52. Based on his radio work with former RTÉ broadcaster John Quinn over a period of five years, John O’Donohue explores themes such as wonder, landscape, the medieval mystic Meister Eckhart, ageing and death. The material, largely unpublished previously, is interspersed with a selection of John’s ‘Blessings’ from his book Benedictus. A book of great insight and riches, presented in John’s inimitable lyrical style, Walking in the Pastures of Wonder will do much to feed the ‘unprecedented spiritual hunger’ that John had observed in modern society. Published with the blessing of the O’Donohue estate, this book also contains a moving foreword from John’s brother, Pat. It is scheduled for publication on Thursday, 12 March 2015. John Quinn is a former RTÉ radio broadcaster. Previous publications by Veritas include Goodnight Ballivor, I’ll Sleep in Trim, also the subject of a TG4 documentary, Letters to Olive: Sea of Love, Sea of Loss, Seed of Love, Seed of Life and Credo: Personal Testimonies of Faith. 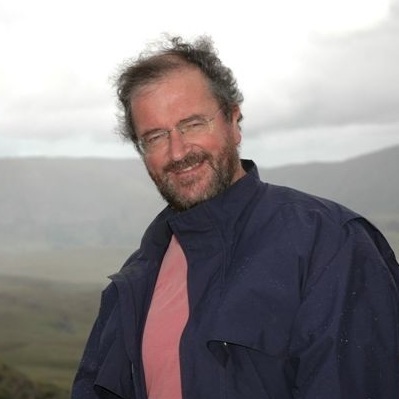 John O’Donohue passed away in January 2008. Recognised by many as one of the most charismatic, inspirational writers of his day, his books on Celtic spirituality, including Benedictus and Anam Cara, became bestselling titles. This entry was posted in Publications and tagged John O'Donohue, John Quinn on January 27, 2015 by Admin. In our lives, we all experience seemingly ordinary moments that take on deeper meaning. They cause us to pause and reflect, and grace our lives with brief flashes of insight and wonder. Small Wonders: Stories of Love, Loss and Letting Go is a collection of these moments from noted theologian and writer Anne Thurston. Arising from contributions written for the ‘Living Word’ series on RTÉ Radio 1, they reflect life’s patterns of chaos and calm, and invite the reader to find solace and meaning in the muddle and mystery of daily living. It was December – one of those bright crisp days. We were doing that annual duty of Christmas shopping. I remember that I had bags in both hands, because I wanted to point to the sky and I had to put them down. We were on our way home, exhausted, as you are when you’ve made the twenty-sixth purchase of hat or gloves or book or CD or tasteful bauble or bangle that you think your third cousin twice removed would really like for Christmas. We were heading for home. None of this really matters because it was then I heard them first. I looked up, and flying above the city streets were hundreds of geese. They were probably on their way from one feeding ground to another – it was lunchtime after all. I called out in surprise and delight. We stood still almost in the middle of the road, oblivious now to everything but the geese brushing dark wings against the blue sky. We watched as flock after flock passed by in their distinctive V formation with that characteristic cry, which now we could make out clearly, even above the noise of the traffic. Like a street evangelist I wanted to tell everyone the good news of what I had seen, but all around me heads remained lowered and people rushed on, unaware of the wonder above them. Exhaustion forgotten, we boarded the tram. Now, one year later, I cannot remember one single thing we bought that day. But I remember the geese. I remember the joy, the utterly unexpected joy of seeing them there high above the streets, stringing out across the winter-pale sky. Small Wonders is available from www.veritas.ie and in all Veritas stores. This entry was posted in Publications on November 28, 2014 by Admin. Papal Nuncio, Archbishop Charles Brown, celebrated Mass in Corpus Christi Church, Moyross, yesterday with Bishop Brendan Leahy and Bishop Donal Murray in honour of a new sculpture and painting dedicated to Our Lady Un-doer of Knots. Limerick artist, Des Langford, painted the image of Our Lady on to an old piece of Irish Chestnut wood. The iron work that accompanies it was sculpted by local blacksmith, Eric O’Neill. Devotion to Our Lady Un-doer of Knots, who is said to help solve complicated problems, has grown in popularity since the beginning of Pope Francis’s papacy. His own devotion goes back to when he was a student in Germany in the 1980s, when he viewed the famous painting by Johann Georg Melchior Schmidtner which hangs in the church of St Peter am Barlach in Bavaria. He brought a postcard of the painting back to Argentina and later had the image engraved on a chalice that was presented to Pope Benedict XVI. This is the first Irish shrine to honour Our Lady Un-doer of Knots and framed copies of the image can be ordered from the parish office. This entry was posted in Irish News and tagged Limerick, Our Lady, Papal Nuncio, Pope Francis, Shrine on November 17, 2014 by Admin. 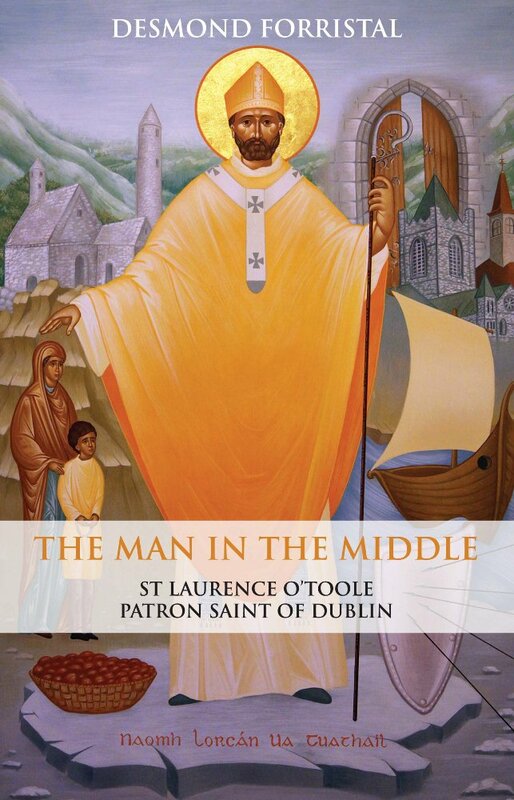 The feast day of St Laurence O’Toole, Patron Saint of Dublin, is 14 November. Born in 1128, St Laurence O’Toole is widely regarded as being one of the most colourful saints in Ireland. As a boy, he spent two years as hostage of King Dermot McMurrough, the man who brought the Normans to Ireland. Upon his release, he entered the monastery at Glendalough, becoming abbot at the age of twenty-five. He was appointed Archbishop of Dublin in 1162 and played a key role during the Norman invasion. The title of ‘the man in the middle’ comes from his position of mediator – as archbishop, he was called on by both sides. He died in France in 1180, and much of what we now know about his life comes from accounts recorded by the French monks at Eu. They questioned the Irish pilgrims that arrived in France to visit his tomb, and wrote to Ireland for details of his life, virtues and the miracles attributed to him. This information was compiled and sent to Rome, leading to his canonisation in 1225. Accounts of his life commissioned by the monks were also widely circulated throughout Europe. Laurence was just ten years old when he found himself caught up in the brutal world of Irish politics. Hy Murray [the district ruled by his father] was regarded as part of the province of Leinster, which at that time was ruled by King Dermot McMurrough, the man who will be remembered forever for having brought the English into Ireland. Dermot was still a comparatively young man, about twenty-eight years of age, but he had ruled Leinster since the age of sixteen and had already earned a reputation throughout Ireland for violence and treachery. Dermot was an intensely ambitious man, who was determined sooner or later to make himself High King of Ireland. He was quite prepared to fight every king in the country if that was the only way to reach the crown. But before he could attack the high king and the other provincial kings, he had to make sure of the support of the chieftains of his own province of Leinster. In keeping with his character, he treated them as enemies to be terrorised rather than as friends to be won. So it came about that Maurice O’Toole received a demand from Dermot to send one of his sons to him as a hostage. If he failed to do this, Dermot threatened to attack and lay waste the territory of Hy Murray. Maurice had little choice but to obey. He decided to send Laurence, the youngest of his four sons. A hostage was a pledge for the good behaviour of whoever he represented. If Maurice acted in any way against Dermot’s interest, he knew that his son would be made to suffer by being killed or mutilated. A very frequent way of taking revenge on hostages was by putting out their eyes, a barbarous practice that was widespread not only in Ireland but throughout Europe. It must have been with a heavy heart that Maurice saw his young son leaving Castledermot for the court of the King of Leinster. The boy himself must have been even more downcast at leaving his home for such an uncertain future. Though he did not know it, he would never live in Castledermot again. There were, however, a few grains of comfort in the situation. One was that Maurice had no intention of doing anything hostile to Dermot and so there was no reason why any harm should come to his son. The other was that Laurence, as the son of a king, was entitled to live in the royal residence and to be treated with the same respect as one of Dermot’s own sons. The noble youth had the spirit of a man in the body of a boy. But after spending some time there and suffering the scarcity of food, the biting cold of the strong north wind, and various forms of ill-treatment, this pleasing and good-looking boy was reduced to a sad bodily condition, starving, emaciated, his skin covered with sores. Presumably there were some men assigned to the duty of guarding him and making sure that he did not escape. The local stories also mentioned a woman, who was among those looking after him and who was gradually won over by his gentleness and innocence. She was the only one among those around him who showed any compassion or affection for the boy. Maurice O’Toole soon became aware of the fact that his son was not living in the royal residence or receiving the treatment that was his due. He may not have known exactly where he was or what was happening to him, but he must have had a good idea that things were not going well. There was little he could do to help. If he attempted any kind of rescue operation, he knew the boy would probably be killed or blinded before the rescuers could reach him. But he never gave up hope that some turn of events would enable him to get the upper hand over Dermot and bring his son home again. Two years passed before an opportunity presented itself. By great good fortune, he managed to take a group of Dermot’s soldiers by surprise and to capture twelve of them. He sent word to Dermot that he had twelve of his men in his power and that he would put all of them to death unless Laurence was set free at once and allowed to return home. Dermot finally yielded and agreed to the exchange, and Laurence’s two-year ordeal came to an end. According to local tradition, Laurence’s joy at leaving the Glen of Imaal was not shared by the woman who had been looking after him. It is said that she was so heartbroken that she used to climb the trees and watch the paths across the mountains, in the hope that she would see him coming back again. Some of the old people could even remember a few lines of the lament she is supposed to have sung as she mourned for her lost little saint. This entry was posted in Publications, Saints and tagged Archbishop of Dublin, Dermot McMurrough, Dublin, Saint Laurence O'Toole, Saints, St Laurence O'Toole on November 13, 2014 by Admin. 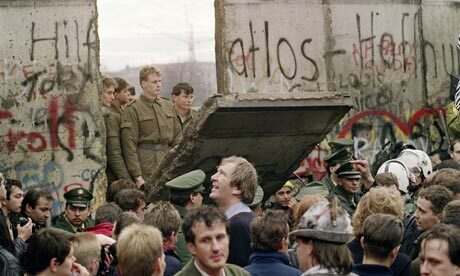 Yesterday marked twenty-five years since the fall of the Berlin Wall. Speaking about the anniversary, Pope Francis paid tribute to those who worked for the Berlin Wall’s end, and made special mention of the role played by John Paul II. He appealed to all of good will to continue spreading a ‘culture of encounter,’ with the aim of bringing down the walls that still divide the world, and prayed that no more people would be killed or persecuted because of their religious beliefs. This entry was posted in Pope Francis and tagged Berlin Wall, Pope Francis, Pope John Paul II on November 10, 2014 by Admin. 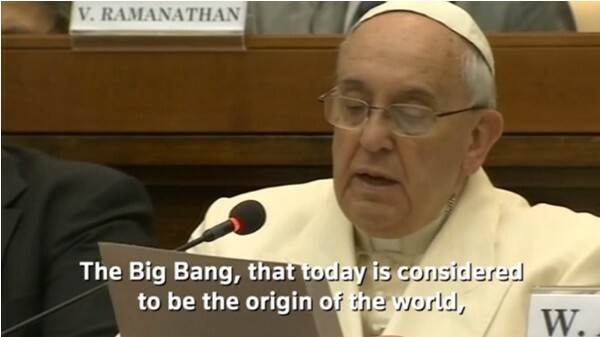 Pope Francis made headlines around the world this week when, addressing a meeting of the Pontificial Academy of Sciences, he said that the Big Bang theory on the origin of the world does not contradict the teaching of the Catholic Church, but rather confirmed it. What Pope Francis told the scientists gathered to discuss the evolution of the concept of ‘nature’, in the Pontifical Academy of Sciences (27/10/14) — where he was dedicating a bust of Pope Benedict XVI — was very much in keeping with his predecessor’s remarks. Still he brought his own freshness to ordinary Catholic teaching on creation, noting that the Big Bang ‘doesn’t contradict the intervention of a divine Creator, but demands it’. He notes how in Genesis, God has given man ‘a different autonomy to that of nature, which is freedom’. However, human beings can fall away from that freedom to a false autonomy that ‘destroys creation’, where ‘man takes the place of the Creator’. In my From Big Bang to Big Mystery: Human Origins in the light of Creation and Evolution (Dublin: Veritas, 2nd edtion, 2012) I tried to spell out what Pope Francis has been saying, showing the same deep respect for science that Pope Francis praised in Pope Benedict during that same speech: ‘As you know, his love for truth wasn’t limited to theology and philosophy but opened out the sciences.’ It’s interesting to see how Pope Francis basically draws, in a modern key, on Aquinas’s notion of God as gifting his creatures with a share both in his existence and his creativity, which I discussed, along with how we can misuse our freedom by choosing the lie and evil to the goodness of creation and of God. This entry was posted in Pope Francis and tagged Big Bang Theory, Pope Francis on October 31, 2014 by Admin. The first of September is approaching, which for many children will mean the beginning of their journey through primary school. Ready for School: A Parents’ Guide by primary school teachers Margaret Horan and Geraldine O’Brien looks at the common questions and dilemmas that every parent faces as they support their child’s development through the early days of school. The following article is an edited extract from the first chapter, which looks at tips and tricks to help prepare in those final weeks. This entry was posted in Parenting, Publications and tagged parenting, school on August 20, 2014 by Admin.